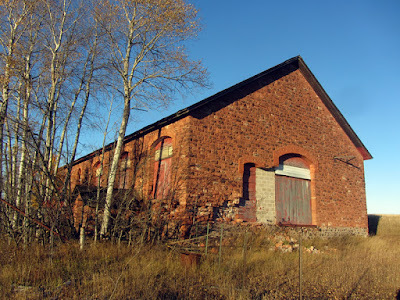 As I explained in my previous post about the Centennial Mine #6, this ground was first explored by the Schoolcraft Mining Co. in 1863, and the Centennial Mining Co. bought them up in 1876 to continue mining the same land holdings. In 1896 the company was reorganized as the Centennial Copper Co., at which time they expanded their reach with new shafts. The faded sign said "NO LOITERING"...well I guess I better get inside then. Wow, what have we here...? 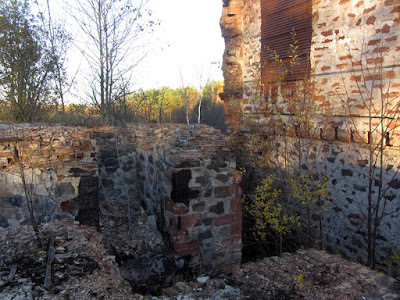 I quickly recognized that this structure must have been the shaft house, where the entrance to the mine itself would have been located, although it had obviously been heavily modified and the shaft mouth itself covered up. 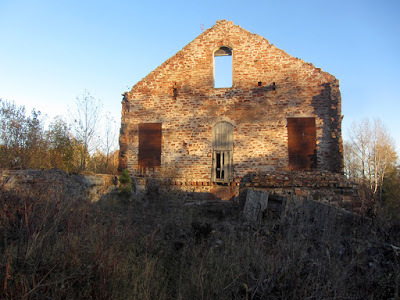 The Centennial Copper Co. was unusual because it sank shafts into no less than three different local copper ore-bearing lodes: the Calumet Conglomerate Lode, the Osceola Amygdaloid Lode, and the Kearsarge Amygdaloid Lode. 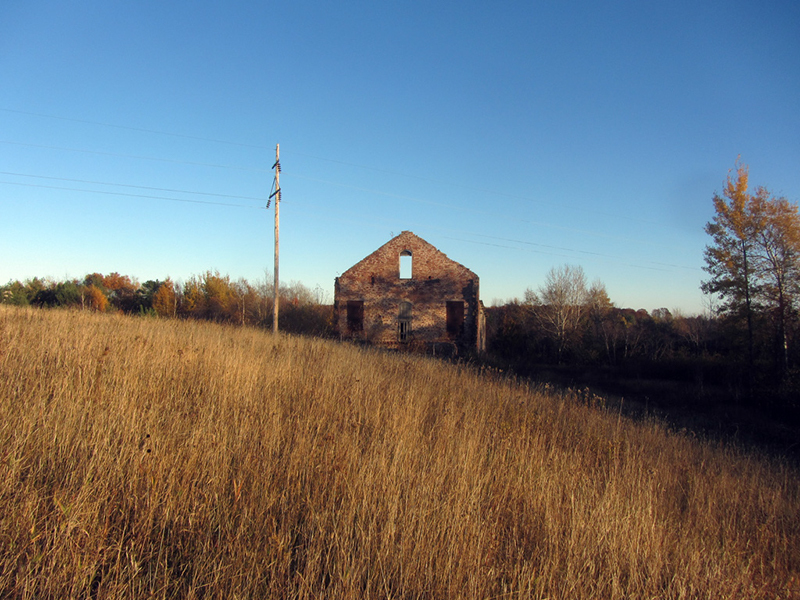 In fact the great Calumet & Hecla Mining Co. (C&H) worked on these same lodes at fabulous profit, a couple miles to the south. 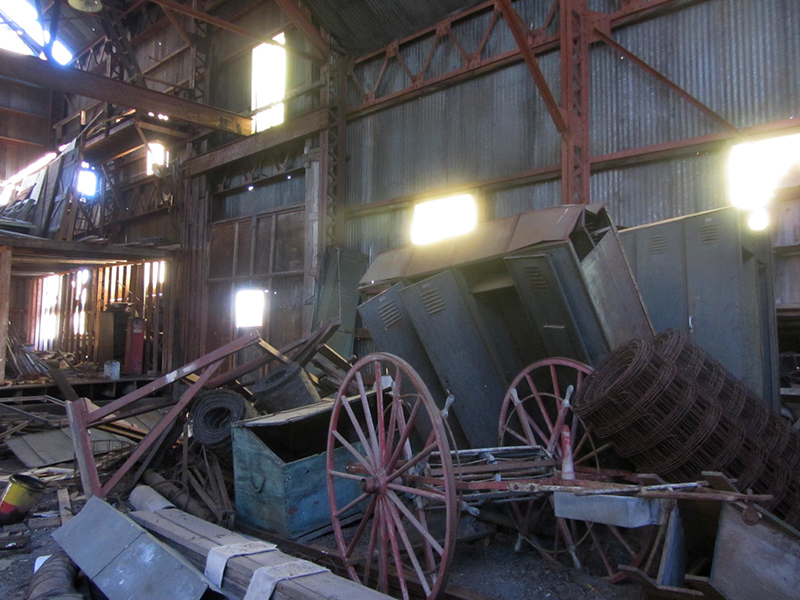 Unfortunately these northern sections were not as rich as the parts owned by C&H, but the two Centennial-owned shafts on the Kearsarge Lode did eventually pay off nicely. 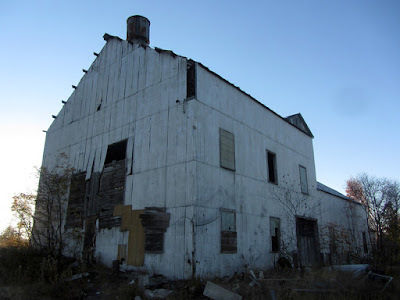 On Google Books I found one report from the Michigan Geological Survey dating to 1912 that lists the Centennial Copper Co. as headquartered in Boston, at an address of 12 Ashburton Place, with Quincy A. Shaw as president, and R.L. Agassiz as vice president. 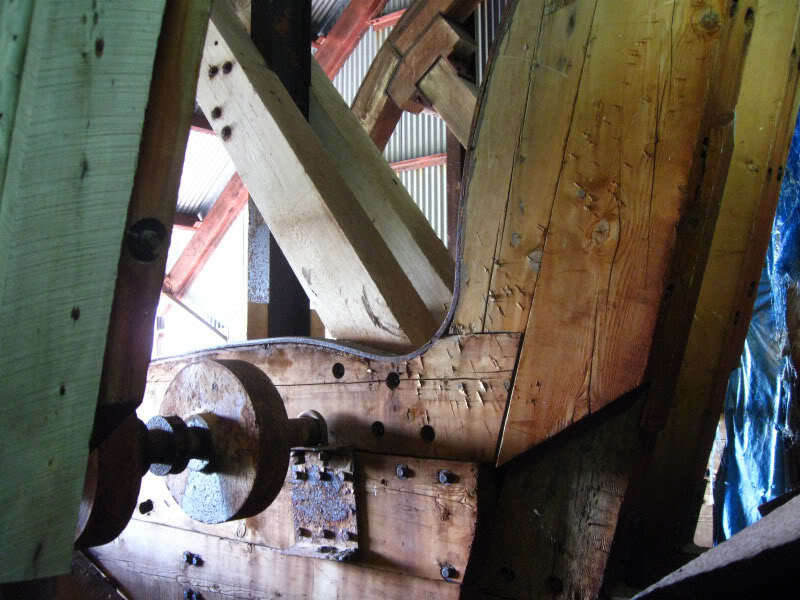 That year it was reported that the #1 shaft measured a depth of 3,821 feet and the #2 shaft measured 3,955 feet. Up to that point, the report stated, the Centennial had operated at a loss, but with new ore deposits being discovered at these depths in the #2 shaft, the coming fiscal year 1912 promised to show a turnaround in the Centennial's thus far mediocre fortunes. 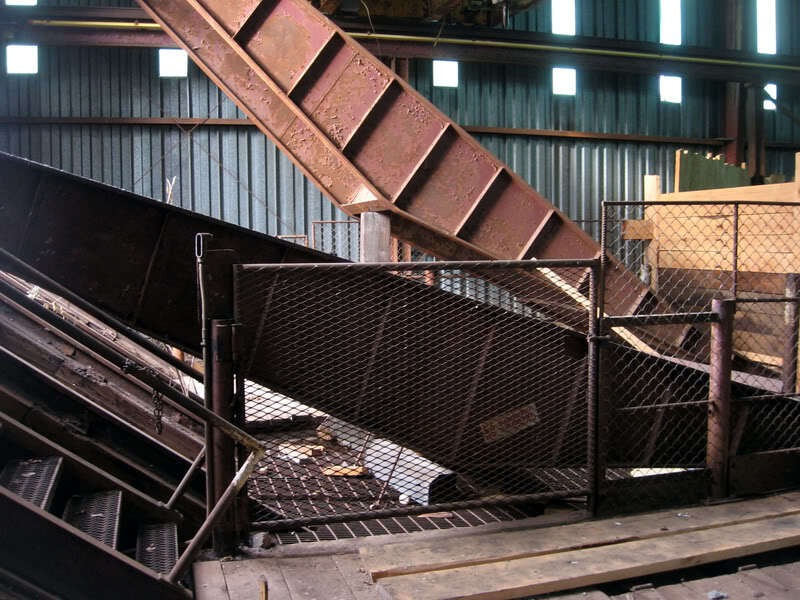 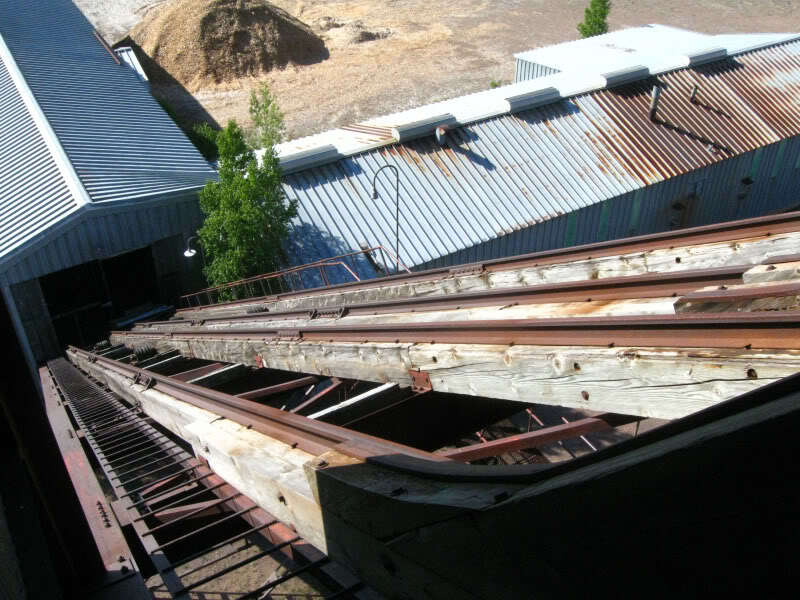 Mike Forgave of coppercountryexplorer.com writes that indeed the Centennial #2 was to become by far the most productive of that company's seven shafts, and one of the most productive in the entire range. It sat directly next to the #1 shaft along the Kearsarge Lode, and together they produced two million pounds of copper per year. Centennial eventually operated a total of seven mine shafts in this area. The unique side-by-side arrangement of the #1 and #2 Centennial shafts meant that they shared many features of their surface plant, including a boiler house, dry house, and machine shop. 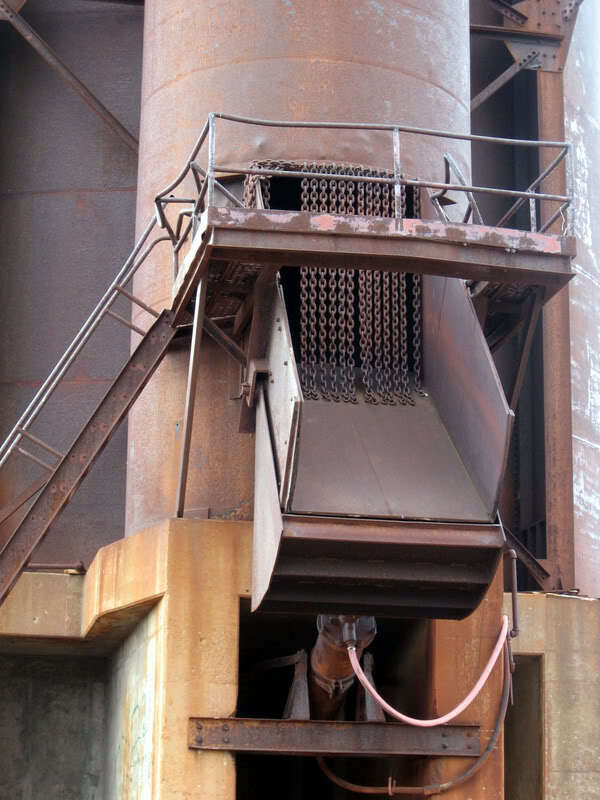 However they each still had their own hoist houses, and compressor houses. The #1's shaft house and rock house has been demolished, so to visit the site today you would probably never guess that this was the location of two mines and not just one. 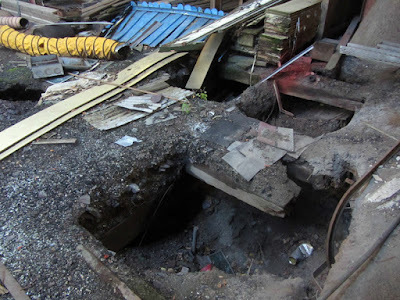 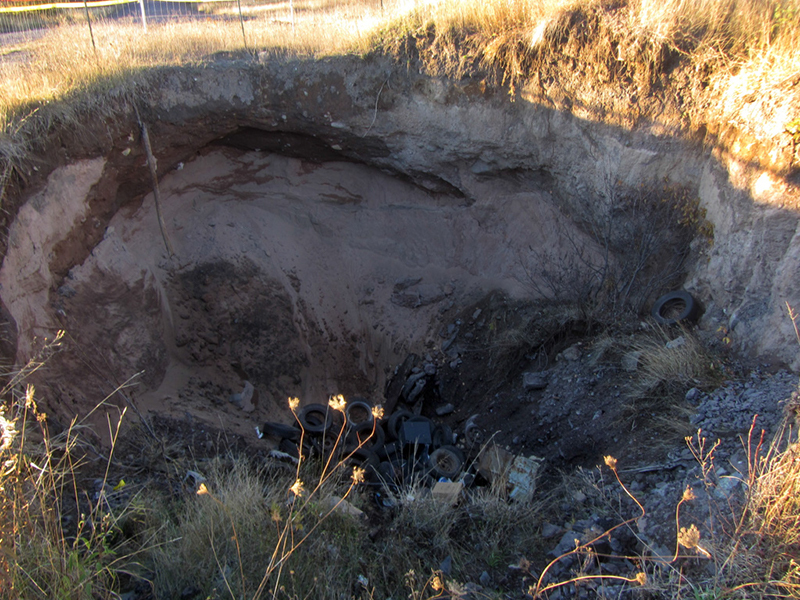 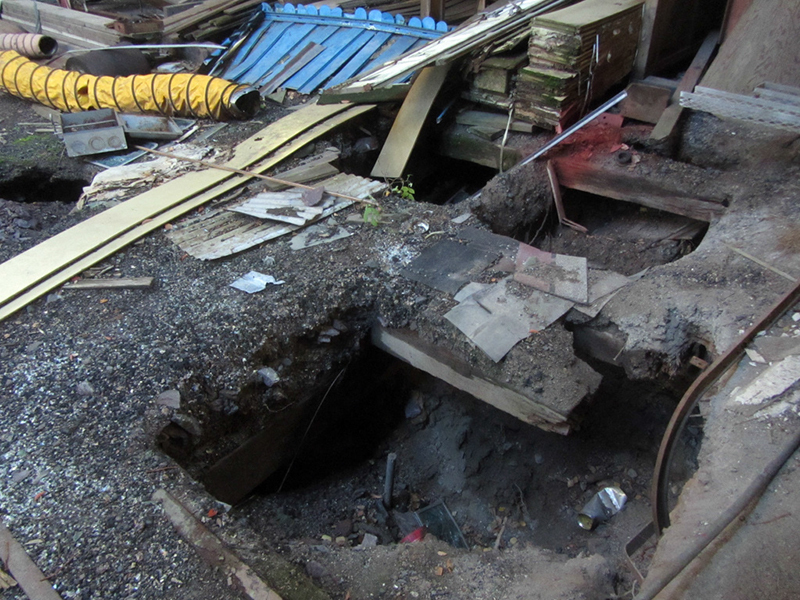 Mike Forgrave observed that because of the disposition of the small Kearsarge Lode underneath the Centennial property, this left very little room for sinking shafts, which was why they were set immediately next to each other. Although they were almost on top of each other, Mike notes that the shafts took off in opposite directions once they got underground so as to maximize their coverage of the rich Kearsarge Lode. After several years however the #1 ran out of room, and all production shifted over to the #2 shaft. 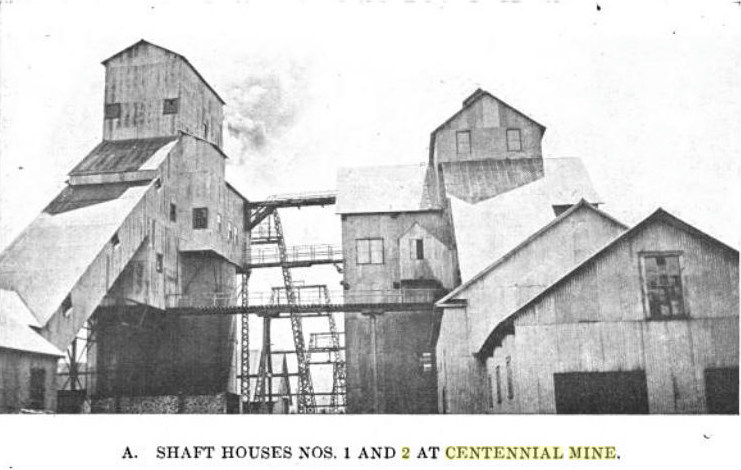 In 1923 the Centennial Copper Co. was bought up by the corporate giant Calumet & Hecla, and as fate would have it the #2 shaft would go on to become one of C&H's most productive shafts for many years. 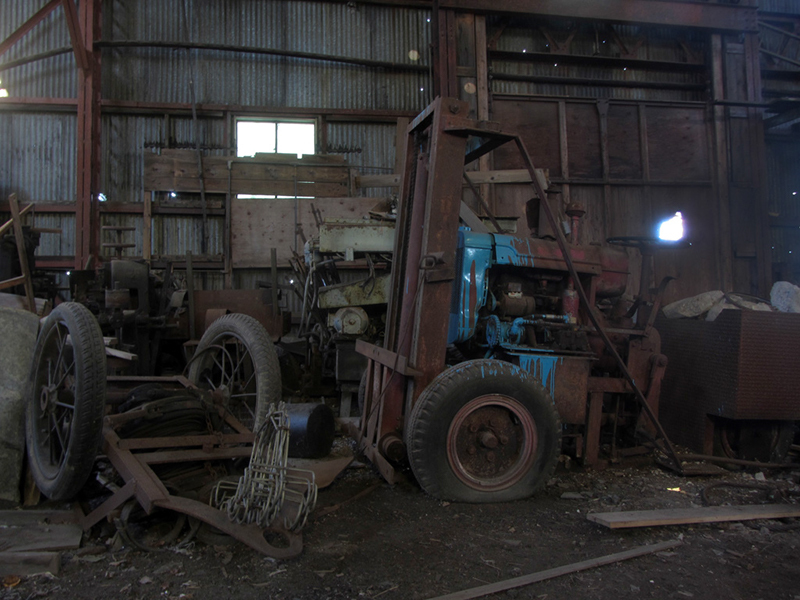 Which is really saying something, because C&H owned a lot of shafts, and a lot of them were highly productive. Mike Forgrave even writes that the Centennial #2 actually helped keep the famous C&H Goliath afloat when its other producers were struggling. 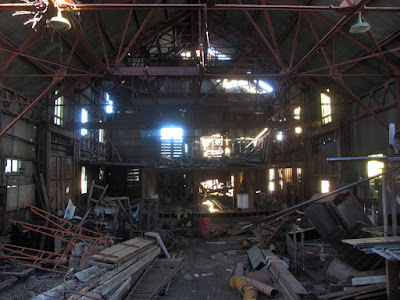 The Centennial #2 was shut down once in its lifespan however, during the Great Depression, but I'd wager this probably had little to do with finding copper and much to do with the economics of the surface world. This mine was reactivated for duty by 1944 to help satisfy the Arsenal of Democracy's ravenous hunger for copper during World War II. After that it remained in continuous production for 22 more years, when it finally closed for good in 1966, almost making it to the end of the Red Metal Empire's reign over the Keweenaw Peninsula, which was heralded by the Strike of 1968-1969. 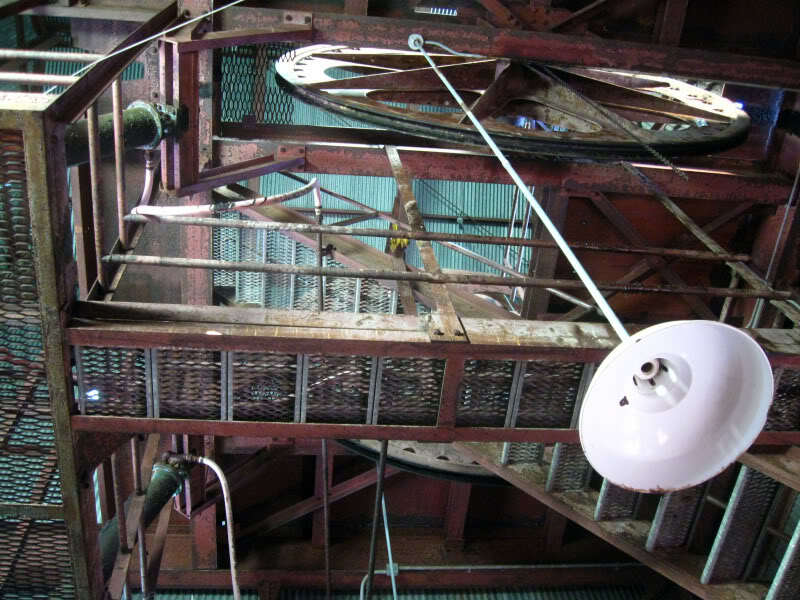 Ironically, the less productive Centennial #6 shaft somehow managed to stay in operation longer than the #2–right until the bitter end in 1968. 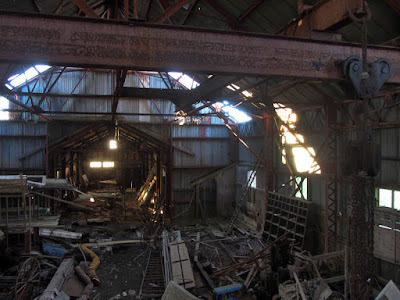 By looking at Mr. Forgrave's atlas, The Copper Empire, I can see that several buildings (the boiler house, one of the compressor houses, and the #1 shaft's hoist house) were demolished when the landfill was put in. 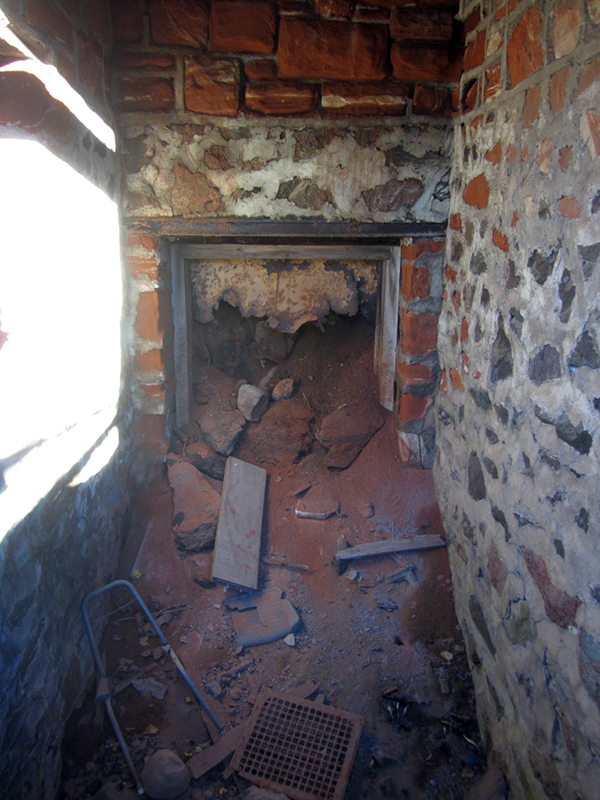 A view inside the foundation reveals what looks to be a petrified lump of old road salt, which seems to indicate that the Houghton County Road Commission most likely put the "roof" over this foundation and used it as a makeshift salt dome at one time. There isn't much in this world that is more awe-inspiring than evening sun beams lighting up Lake Superior sandstone, even if the building is a little jacked up. An entry on the geology hobbyist website mindat.org observes that the old rock piles of the Centennial #1 and #2 offered good pickings, and contained interesting minerals such as copper crystals, silver, datolite, "and incredible quartz/epidote crystals." However it was also said that Houghton County used the rock piles for their own uses (this usually means road building or something along those lines), which might explain why there are no more rock piles to be found here at the #1 and #2. 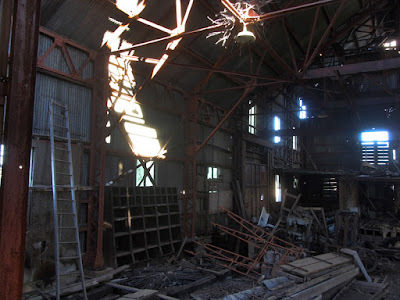 There wasn't much left of this building that once housed the massive hoist engine of the Centennial Mine #2, but it was nothing if not picturesque in its state of ruin. 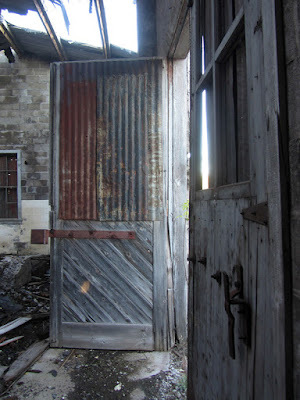 Mike Forgrave posited in his entries that even though it survived demolition when the landfill was put right on its doorstep, the front of this building was unceremoniously taken off when the power company brought a new run of powerlines almost right over it. I have covered mine hoist structures in older posts, but to refresh your memory these beefy foundations once supported the mighty engine that would have driven the cables that pulled men and ore up out of the mine's depths. 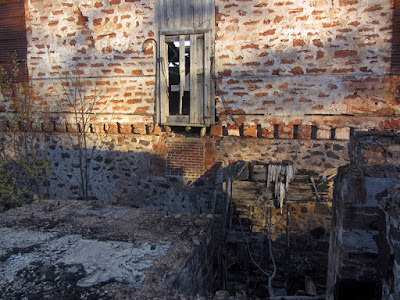 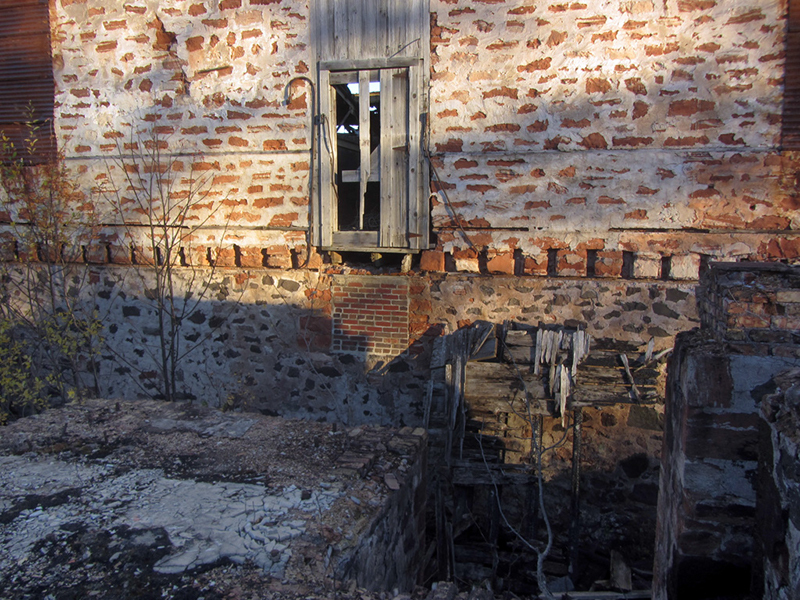 The only difference here is that the foundations are usually made of poor rock or concrete, not fancy Jacobsville sandstone and brick like you see here. This was a sign that the Centennial Copper Co. was highly optimistic about their chances of profiting off of these mines–a move that usually results in disappointment and bankruptcy, but which leaves behind a very handsome corpse. The #2 Centennial however was one of the rare ones that justified this lavish expenditure, by remaining one of the richest mines in Michigan for decades. 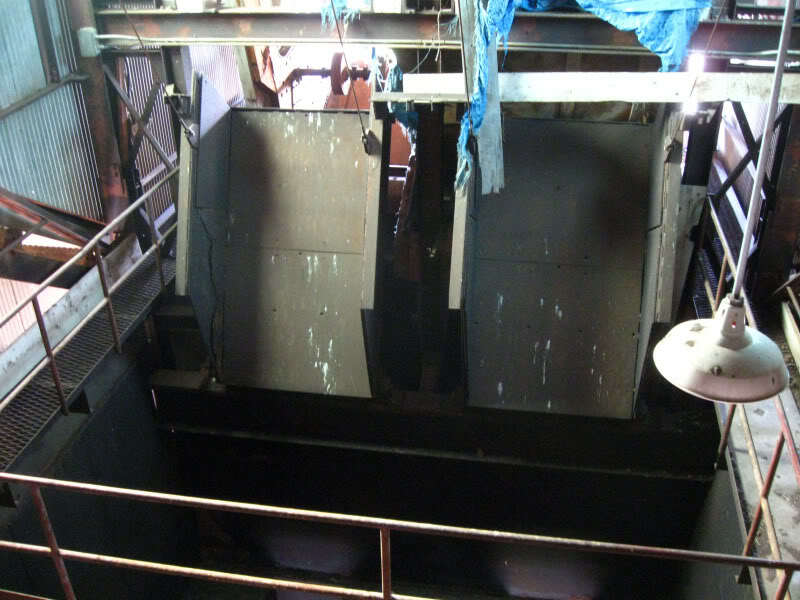 It is unusual to see a compressor plant conjoined with the hoist house, since usually the engine house that supplied the hoist with its massive power needs was the closest structure. 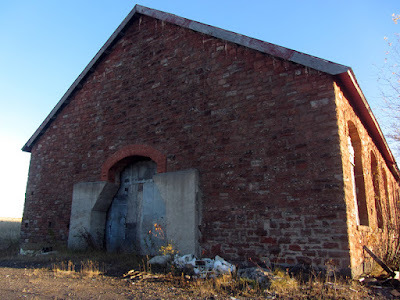 The point, by the way, of a compressor house at a mine was mainly to provide pneumatic service lines to the underground where the miners were using drills and other machines that ran on compressed air, since it would be hazardous to use anything combustion-powered in a poorly ventilated space. 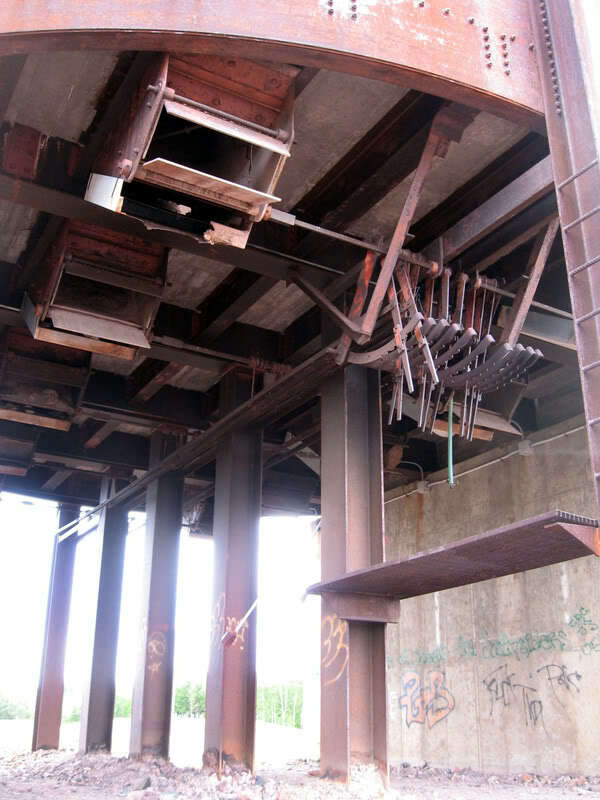 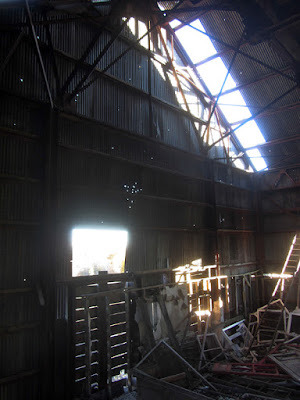 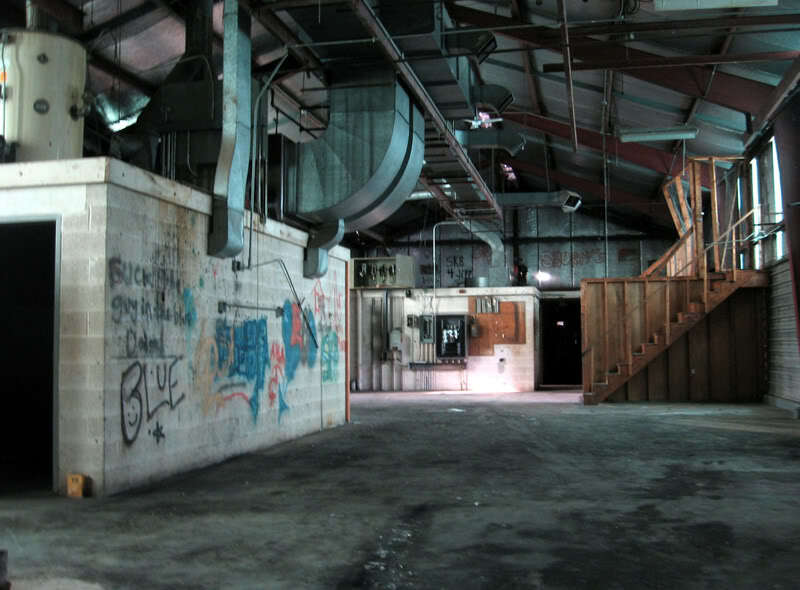 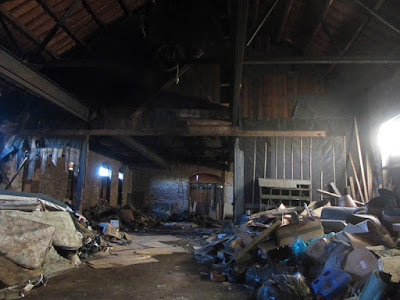 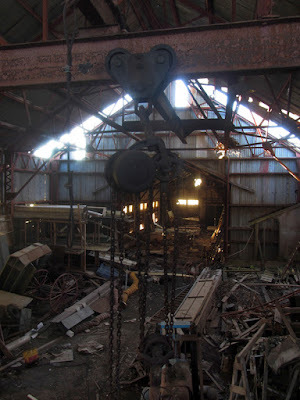 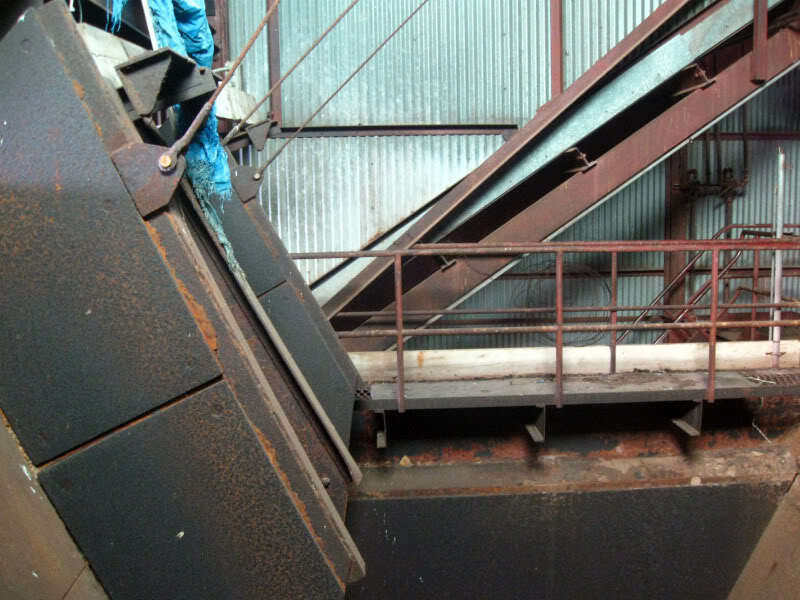 That space used to be spanned by the hoist cables, which ran between the hoist house and the shaft house, supported by a series of pulley stands that ran along the ground that the landfill now occupies. Just the end of another halcyon day in the Copper Country. This post has been split off from older episodes, written in 2008-2010. 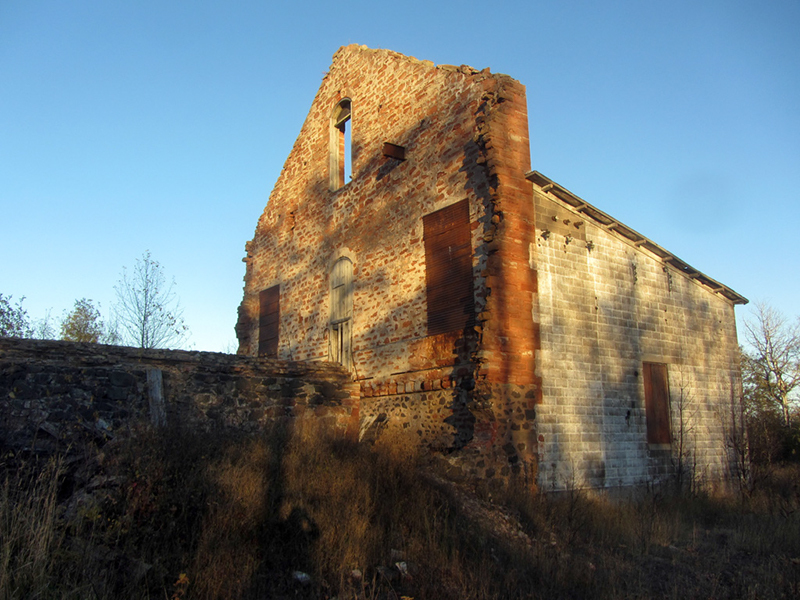 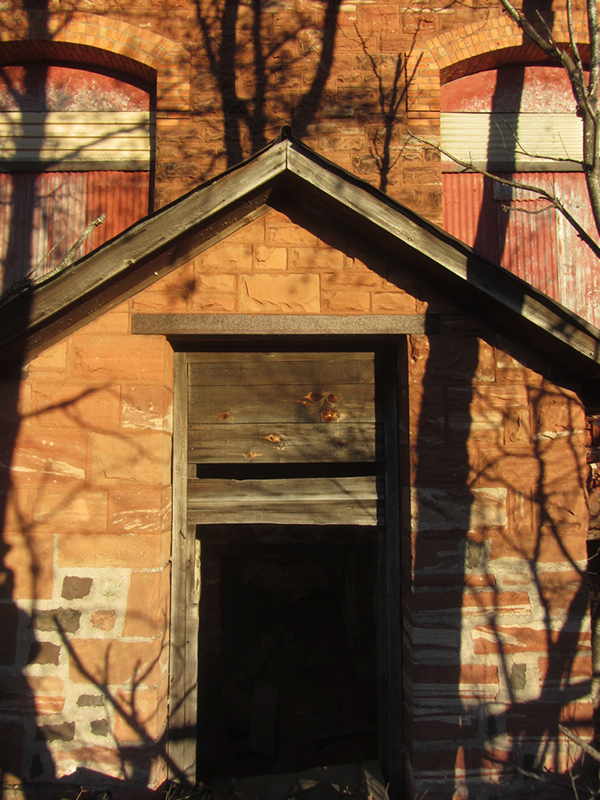 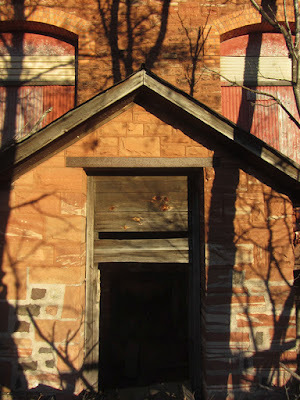 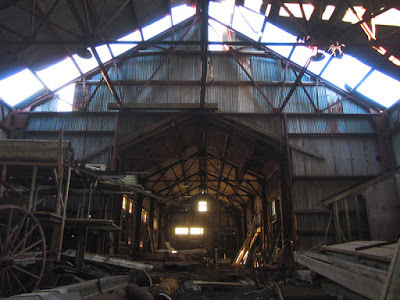 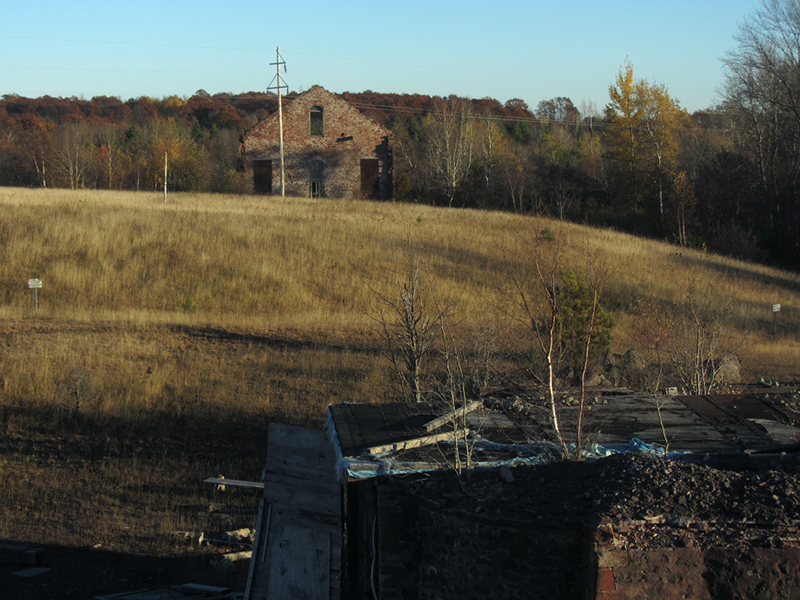 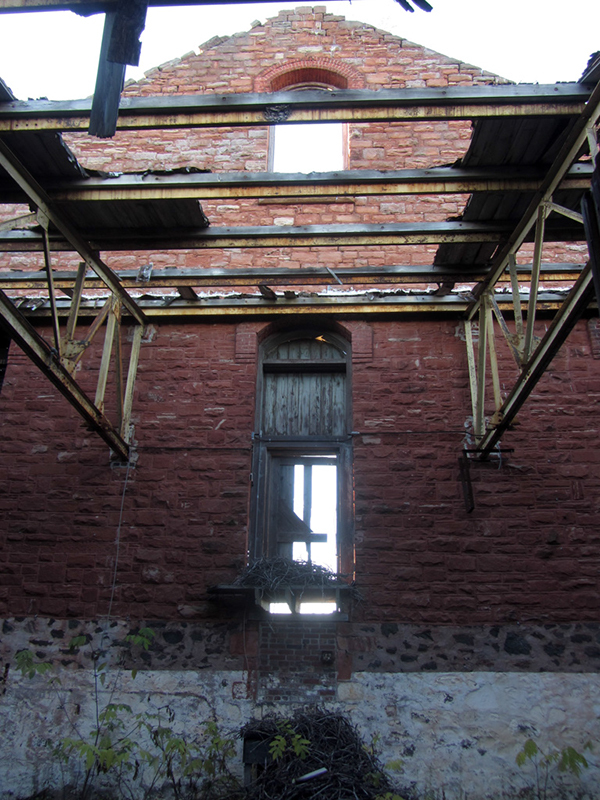 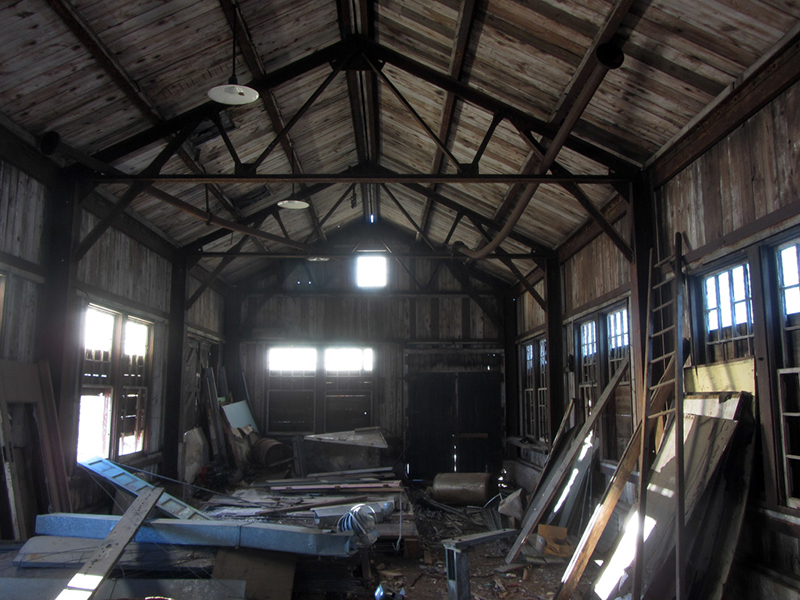 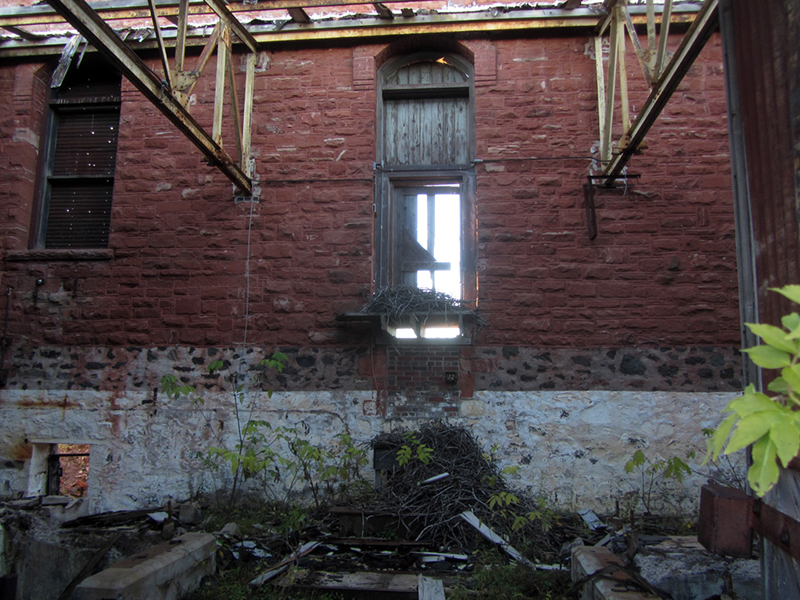 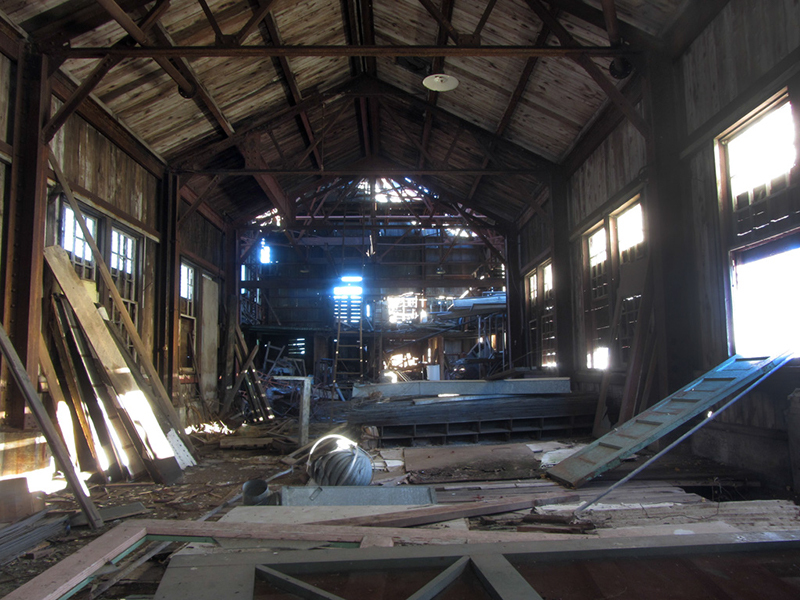 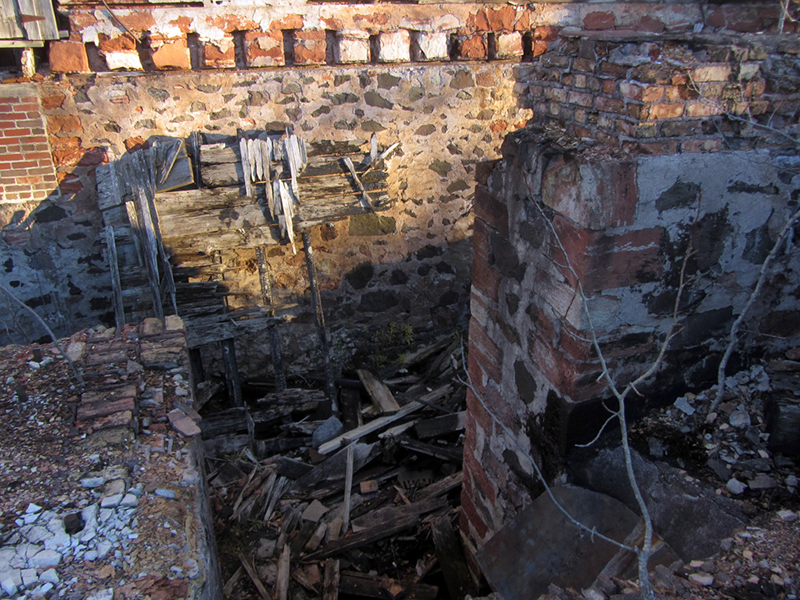 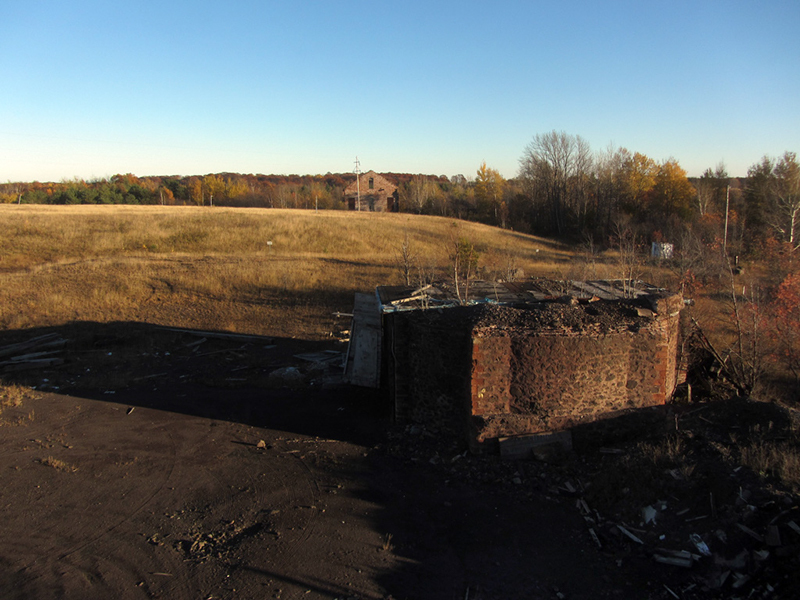 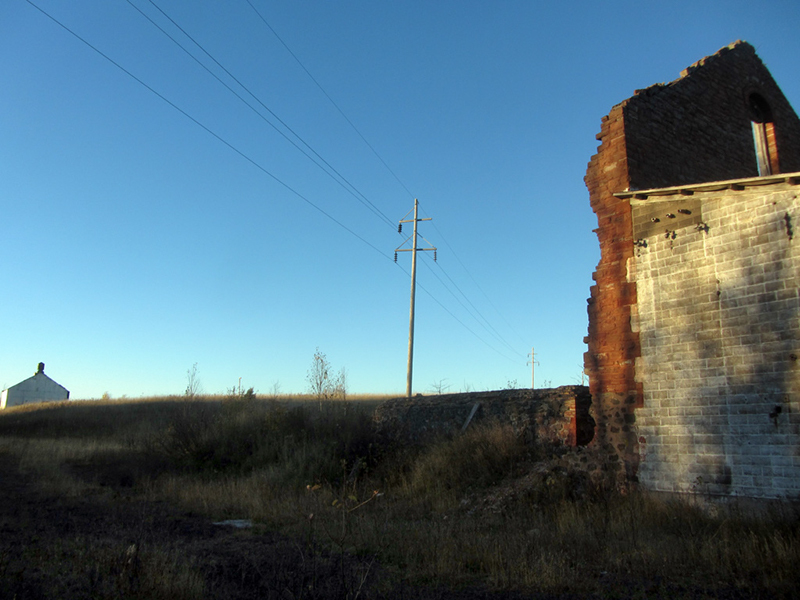 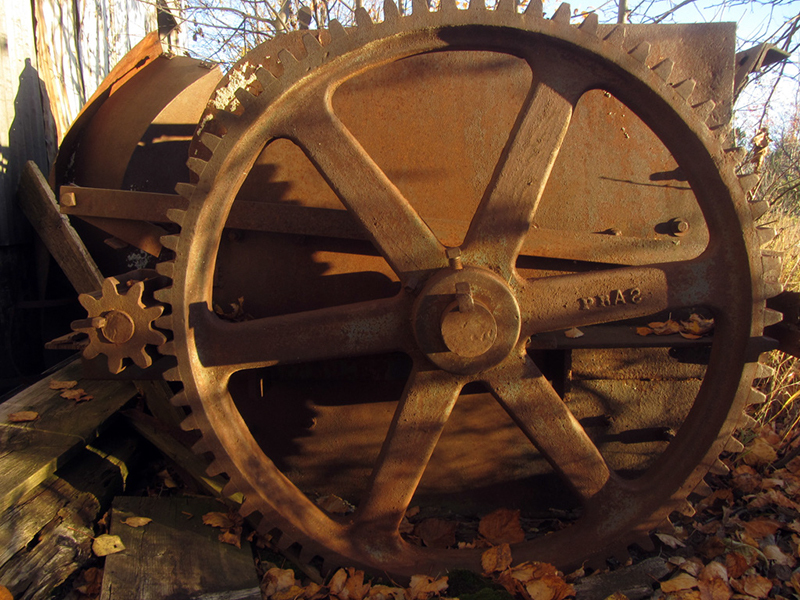 As far as Michigan copper mine ruins go, the Centennial #6 is one of the most intact. 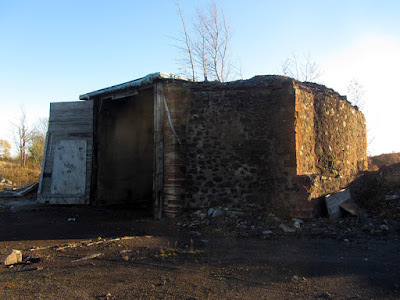 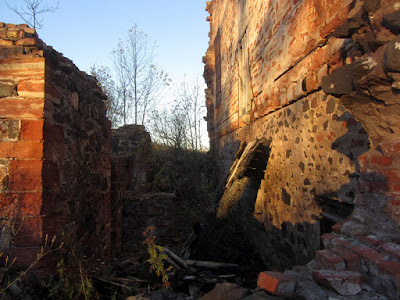 It is an example of what a headframe / rockhouse looks like (when it's not just a ruined foundation), once a common sight across the land known as "the Copper Country." It is also a familiar landmark to anyone driving along the winding path of US-41 through the heart of Michigan's Copper Country. 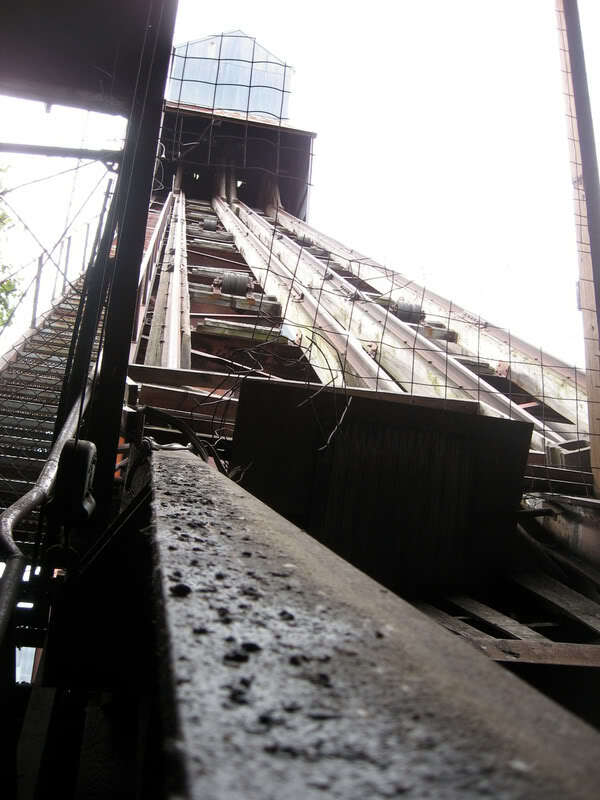 In fact, the reason US-41 is there and is shaped like it is, is because it follows the copper-rich spine of the Keweenawan Rift, along which are found all of the mining locations of the peninsula. US-41 was built to connect all of these mining villages. The Centennial Mining Co. was organized in 1876 (the centennial year of American independence, hence the name). 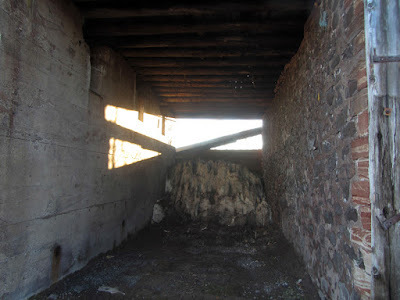 According to my colleague Dan at substreet.org however, the shaft that would become the Centennial #6 was first sunk back in 1867 by the Schoolcraft Mining Co. (which was founded in 1863); these structures you see here are all modern additions. 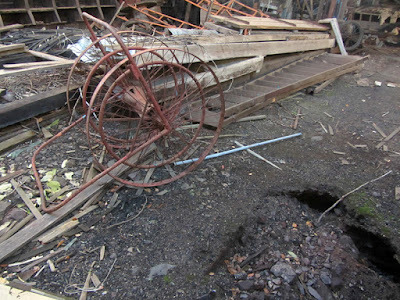 The Schoolcraft Mining Co. started digging into the Calumet Conglomerate Lode, going 2,800 feet down without finding much copper, but they kept working the mine's 13 levels until they bankrupted. The Centennial Mining Co. then took over and dug deeper. 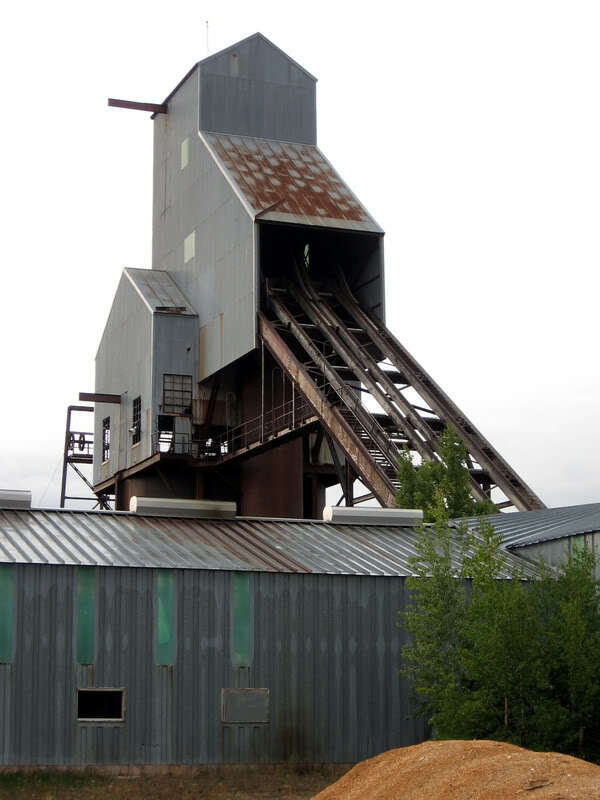 According to my colleague Mike Forgrave of coppercountryexplorer.com, the Centennial eventually operated a total of seven shafts in the area, and in 1896 they were reorganized as the Centennial Copper Co., which was when they started the mine shafts that came to be called the #1 and #2. 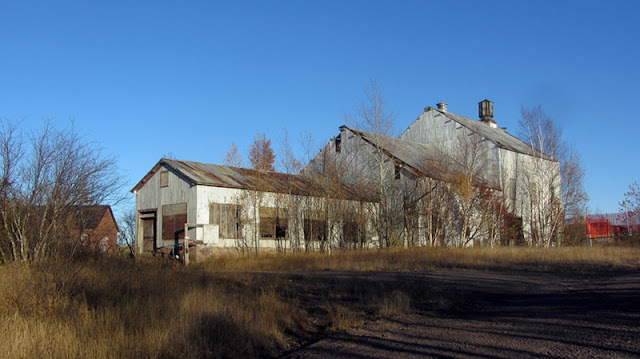 In 1923 the giant Calumet & Hecla Mining Co. absorbed Centennial as their empire grew across the Keweenaw Range, although during the Great Depression this mine was idled. 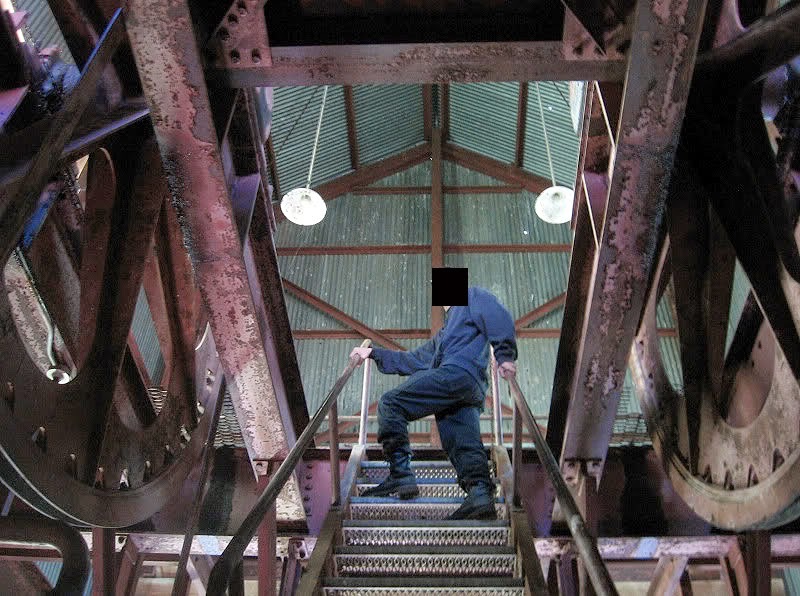 The grating on the floor in the above shot indicates the mouth of the shaft. A drop of up to 3,000 or in some cases 4,000 feet into eternal darkness. At those depths, I’ve read that you can begin to feel the heat of the magma below Earth’s crust. 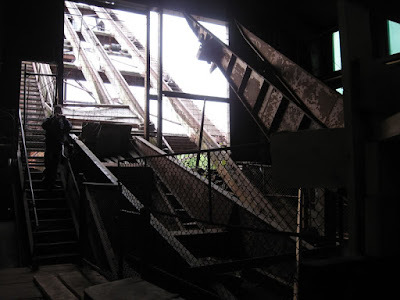 Can you explore the actual mines? No; they are not naturally ventilated, the shafts are too steep to climb down without gear, and most are flooded up as high as the water table anyway. 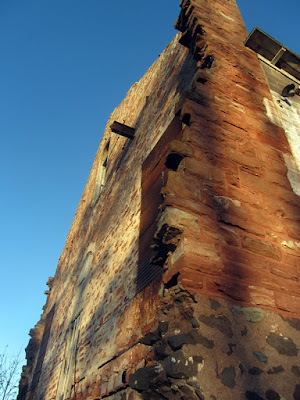 That said, it is entertaining to note that the security measures on this building at the time consisted of a big rock leaned against a bullet-riddled door to keep it from flapping in the breeze. 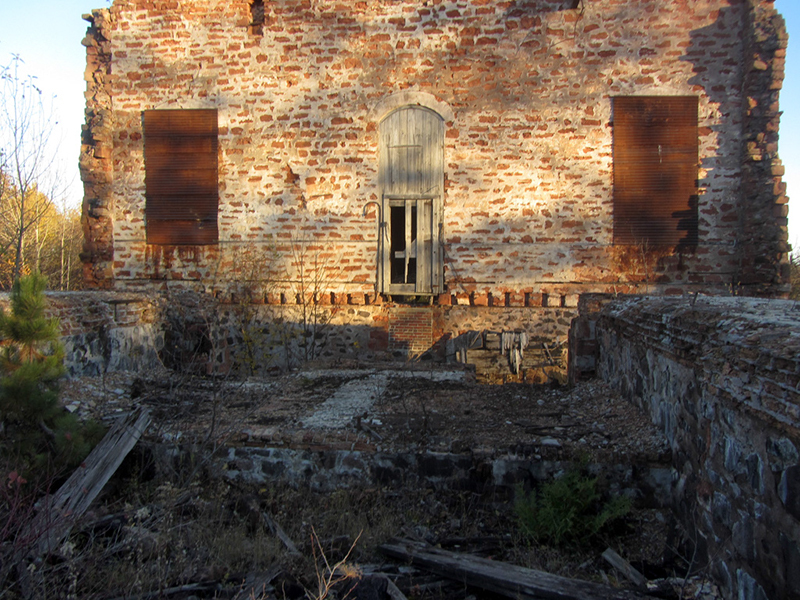 The labored and prolonged death of the copper empire had been telegraphed years ahead of time. By the end of the Second World War the writing was on the wall, and the next 30 years was nothing but an exasperated epitaph. By feeding off the remains of less fortunate mines, the great C&H had managed to outlast them all. But even its time would come. 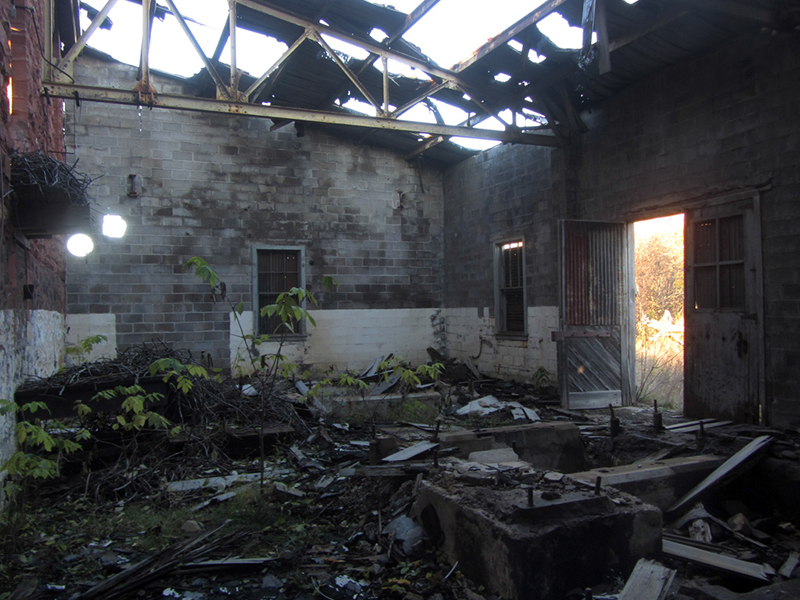 All of the “last great hopes” C&H poured desperate funds into–Gratiot, Kingston, Centennial, Ahmeek–would only delay the inevitable. 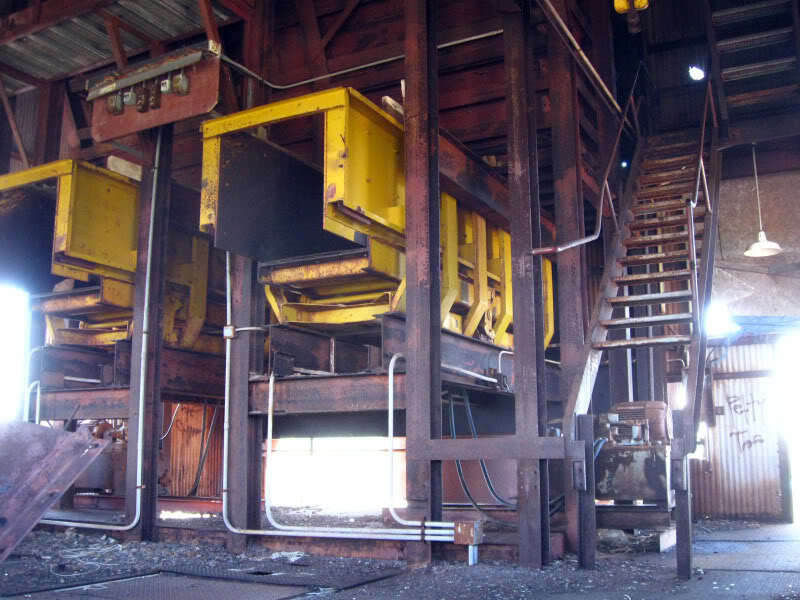 With the 1968 labor strike C&H gave up the fight. It was over; the great copper empire was dead. 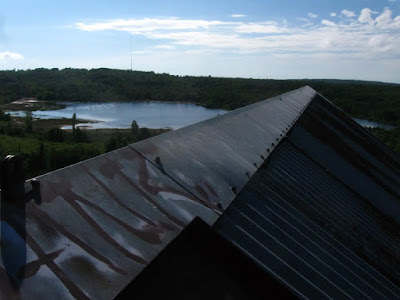 The year 1968 signaled the final death knell of the once illustrious copper mining industry in Michigan. 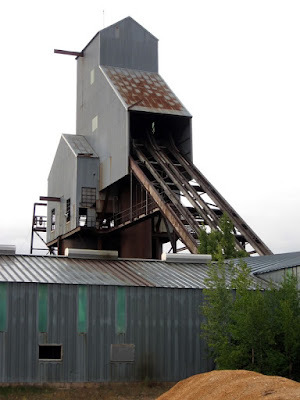 By that point only the big, reliable mines owned by the big companies were still operating–such as the Quincy Mine's #2 shaft, the Calumet & Hecla's Osceola Mine #13, and Centennial #6. The Champion #4 had shut down in 1967. 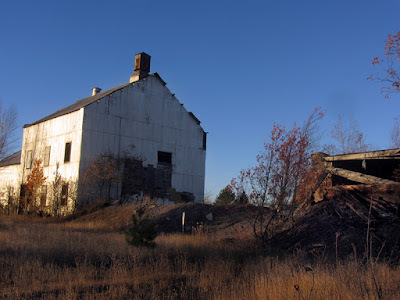 But mounting operational expenses stemming from mining at extreme depths, as well as the labor problems put the final nail in the coffin, and copper mining ended in Michigan after about 125 years. 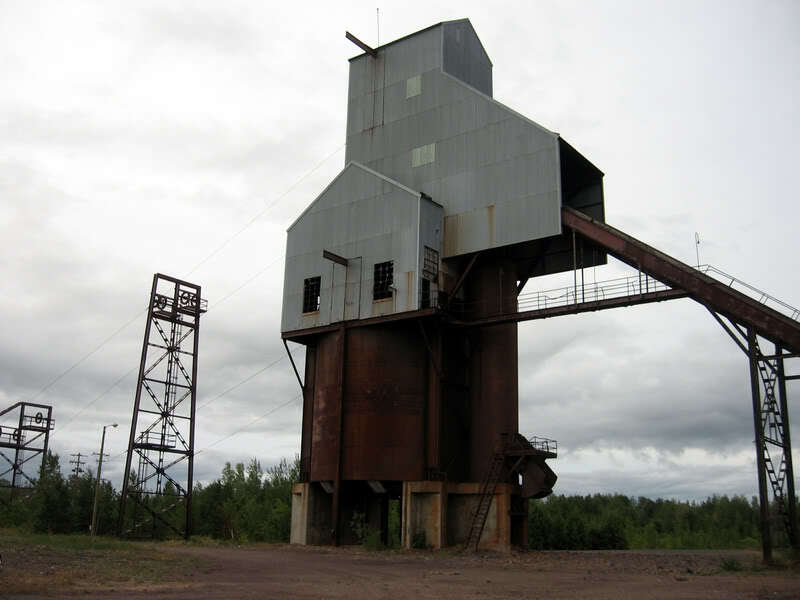 Only the White Pine Mine in Ontonagon County remained open, but it subsisted off of chemical mining as opposed to digging for native deposits. 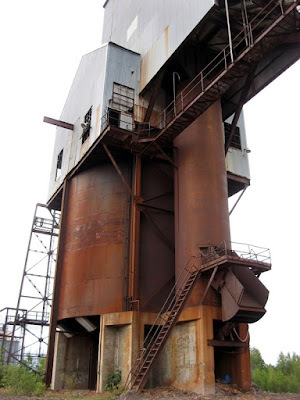 This tall structure is called the headframe or rockhouse, because it is at the head of the hoist system for the cables that pulls men and ore from the mine, and because it sorts the loads of poor-rock from the loads of valuable ore, and dispenses them into freight cars on a railroad track below. What happened in 1968 to precipitate the death of copper mining in the Keweenaw was that the men of the Kingston Mine walked off the job on May 10th, regarding a safety issue with a man-cage after a man was injured. 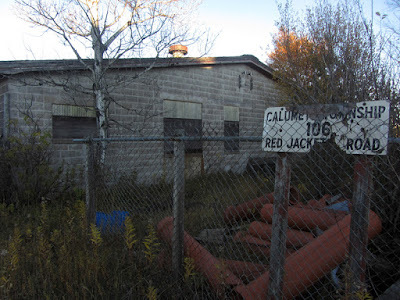 Apparently the rest of their brethren at other Calumet & Hecla mines also stood in solidarity with their move, and went on strike as well. They also wanted equal pay to the miners at the White Pine Mine. According to a paper by Brendon Pelto of Michigan Tech, most people attribute the death of copper mining in Michigan to the fact that the copper simply "ran out," but this isn't necessarily true. 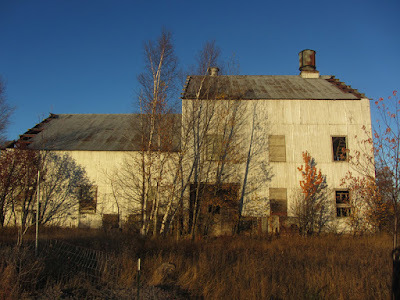 The copper was still down there, but it was a combination of mounting operating expenses to extract it, the aforementioned nine-month labor strike, and the fact that C&H had recently been bought out by Universal Oil Products (which was not particularly interested in copper mining, or the livelihood of the Keweenaw–but rather C&H's more lucrative Detroit holding, Wolverine Tube Co., which I have featured here before in an older post). 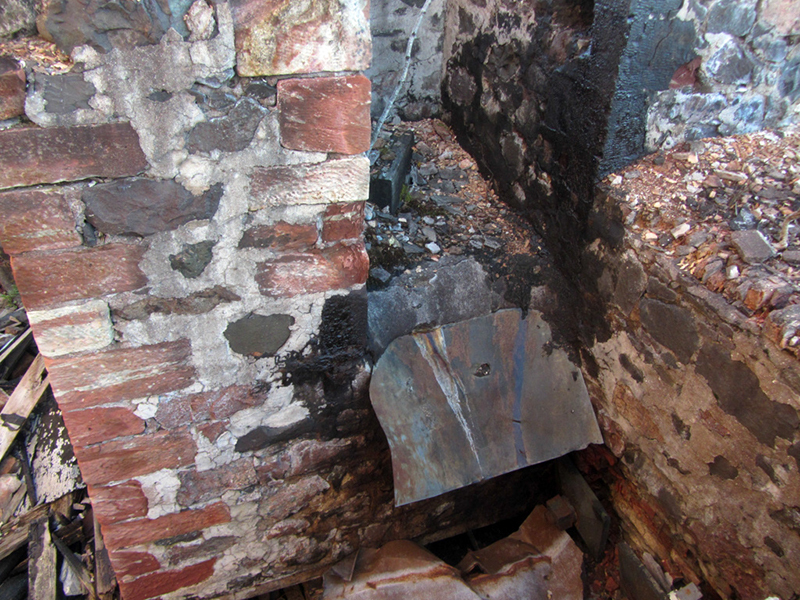 It was all three of these factors that contributed to bringing about the death of the Copper Country. 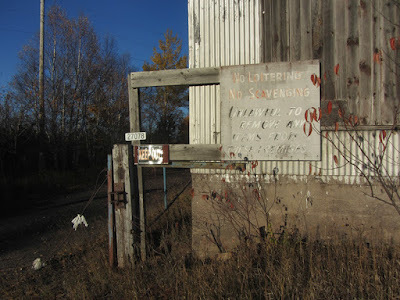 According to their numbers, Universal Oil saw the C&H mines as only marginally profitable to start with, and since Universal received about 80% of the copper they needed from sources outside of Michigan anyway, when this labor dispute cropped up they simply shut down all of the C&H mines across the board, bringing an ignominious end to the once-great "Red Metal Empire" in one fell swoop. 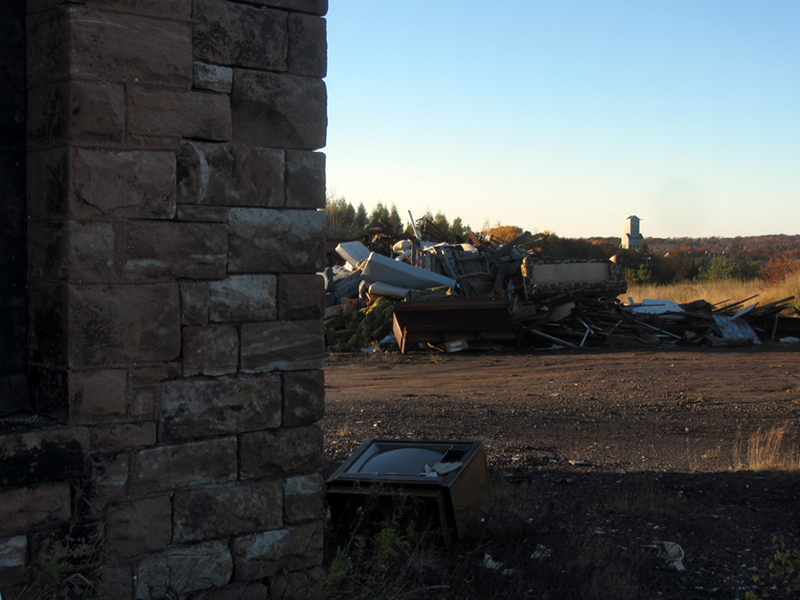 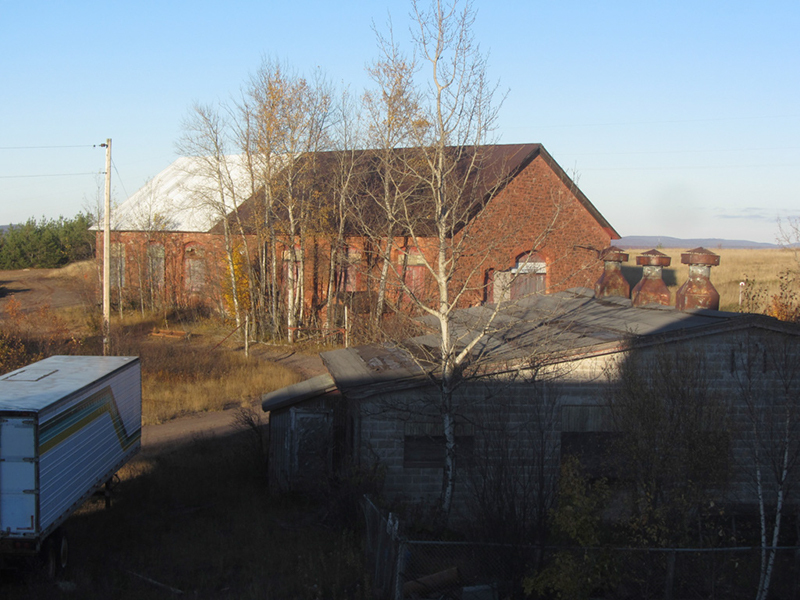 The Keweenaw metropolis never recovered from the loss of its core industry and has basically been a ghost town ever since, but Universal Oil still owns Wolverine Tube to this day, Pelto writes. 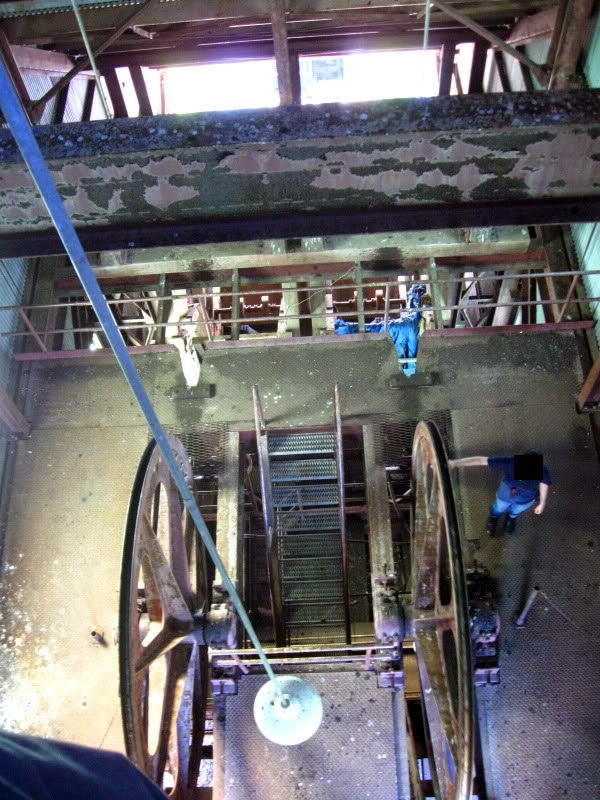 These massive pulleys once held the same cables that ran the trams in and out of the mine. Mike Forgrave notes that the pulleys are actually called "sheaves." 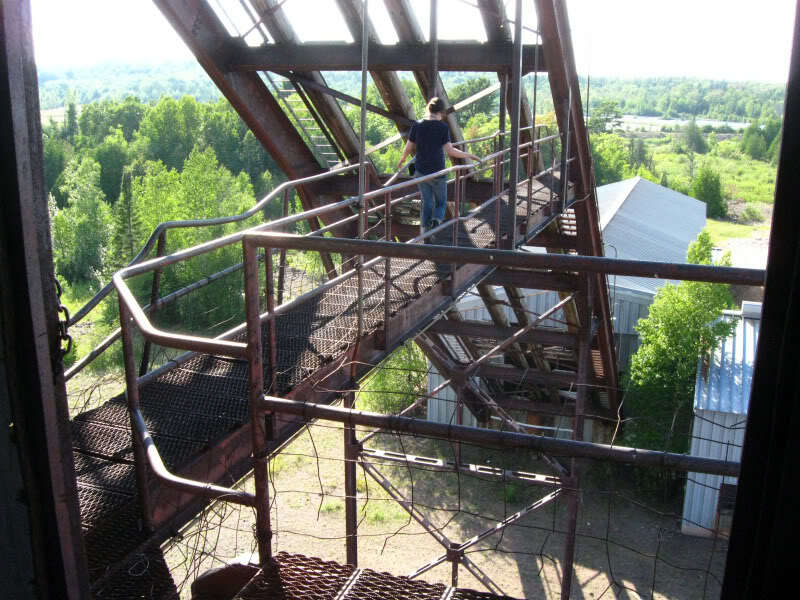 Overall, despite the incredible and insurmountable loss of industrial capital that the fall of the Michigan Copper Empire represented, I think it has been a net gain on the whole; now at least the pollution-scarred landscape that mining left in its wake has begun to heal, the decimated forests have grown back, and the Keweenaw enjoys a tourism business that it otherwise would not have had if it were still a smokestack-riddled industrial hell.